Manufacturer of a wide range of products which include volumetric liquid filling machine, edible oil filling machine, juice filling machine, milk filling machine, mineral water filling machine and packaged drinking water filling machine. Our client can also avail a vast range of Volumetric Liquid Filling Machine widely used for filling various free flowing granular products like tea, sugar, salt, pulses and grains. Our filling machines can be customized for any size or shape of bottle, giving you the flexibility to create distinctive products that will grab a customer’s attention. This machine is used to Rinsing, filling & Capping the PET Bottles of Packaged Drinking Water, Juices, Vinegar , Liquor, Milk and other still products. We are one of the well-known manufacturers and suppliers of Mineral Water Filling Machine. The offered mineral water filling machine is specially fabricated for filling drinking water in bottles and jars. Our manufactured mineral water filling machine is highly acclaimed for easy operation, fast speed and high durability. The supplied mineral water filling machine is available at very cost effective market rates. We are one of the well-known manufacturers and suppliers of Packaged Drinking Water Filling Machine. The offered mineral water filling machine is specially fabricated for filling drinking water in bottles and jars. Our manufactured mineral water filling machine is highly acclaimed for easy operation, fast speed and high durability. 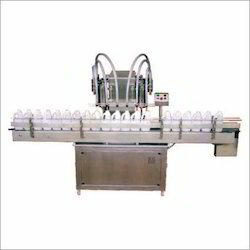 The supplied mineral water filling machine is available at very cost effective market rates. Our piston filler suitable for liquid filling with thick viscosity like Honey , Juices, Ketchup, Jams etc. in Glass & Pet Bottle or Wide mouth Jars and Cans. By capitalizing the skills of our professionals, we are able to provide quality approved range of Filling Equipment to our esteemed clients. This Filling Equipment is develop at ultra-modern unit using the premium quality components and advanced technology as per the define quality standards. This product is easy to use and provide efficient working to the clients as per their requirement. We never compromise with the product quality and deliver our assignments in a committed time frame for gaining maximum customers satisfaction. For the complete customer satisfaction, we are providing them desirable assortment of Semi Automatic Liquid Filling machine. 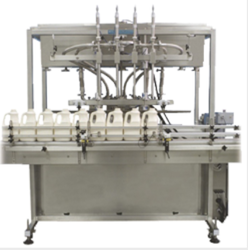 The offered range of Semi Automatic Liquid Filling machine is developed by competent persons, consuming optimum grade components including updated technology. Apart from this, this range of product offered by us is examined on diverse parameters and provided with unique designs which match the requirements of customers. We are committed to deliver our assignments within given time frame using customized packaging.